Youderian Construction Inc. was founded in the early 1950s by Fred Youderian. At the time of opening, Fred envisioned this business fulfilling the needs of local businesses, farmers, ranchers, and homeowners in Central Montana. Fred started the company with 1 employee and a small fleet of equipment. The majority of the work at this time was around Stanford, Montana. Youderian Construction built roads, dug wells, developed springs, installed irrigation systems, and handled site preparation for building foundations and dams. In 1979, Mike Youderian joined his father’s company. The addition of Fred’s son made the business a family affair. With the additional set of hands and a hunger for growth, Mike expanded the capabilities of the company. The needs of the local ranching clientele required Mike to add machinery to the business. Youderian Construction started acquiring commercial work at this time. Mike updated the machinery to meet the company’s expanding needs. Mike’s son, Tyler, joined the family business in 2005, after earning his degree in Civil Engineering. Tyler looked to expand markets by adding to the list of services the company could provide customers. With the addition of more machinery and skilled personnel, Youderian Construction secured contracts building retention ponds, landfills, road construction, and dam reconstruction projects. The expansion of Youderian Construction continues today. Mike and Tyler strive to hold true to the core values of the company by delivering quality work both locally and in neighboring states. Currently, Youderian Construction is serving its customers’ needs throughout central Montana, with additional projects underway across the state. Youderian Construction currently employs skilled professionals who specialize in different focus areas, expanding the company’s capabilities. 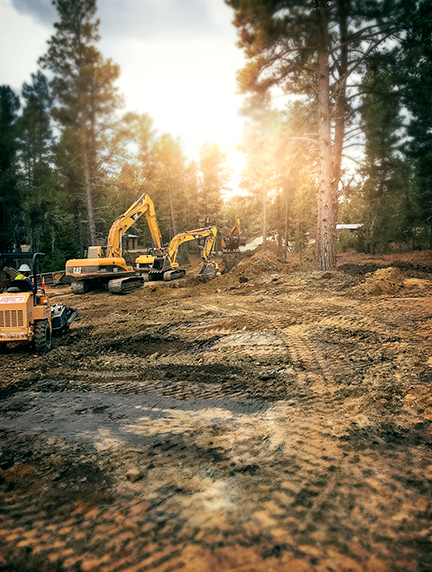 From heavy equipment operators, to truck drivers and mechanics, Youderian Construction prides itself on being a full-service excavation company running a fleet of equipment specifically comprised to meet the diverse needs of their clients in Montana and neighboring states.